2/10/2012- The White Sands Pupfish have added their Vegas Gold Look to the baseballs for the 2012 season. The Pupfish will use a Rawlings All Star Style Baseball with Vegas Gold Seems and Black Writing. 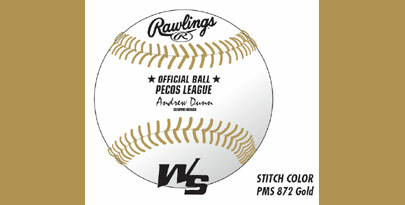 With the Pecos League's new contract with Rawling the Pupfish ball is going to be a hit with fans and collectors.